but to be fair... there is no 90+ % turnaround in my industry.. so something is wrong with the initial pay in trucking.. In order to get young/new people in trucking (and more importantly "to stay") something will have to change. If this change means additional pay for experienced drivers currently working in order to pay new Drivers more, than that would be a great thing for those who have earned it..
With all due respect Alan, we thought maybe you were looking for help and advice from successful truck drivers. Everything Brett said was spot on. Apparently you just wanted a place to vent. Truckers usually hold themselves back, not the company. The company needs their drivers moving freight. In fact they need it badly. Consequently the ones who prove themselves reliable at keeping the team in the winning column get utilized effectively and efficiently. There are very few first year rookies who have what it takes to be counted on like that. You were still in the learning curve, but you didn't push through to the point where your potential became obvious to the folks who were above you in the chain of command. I thought I could make above the average miles to earn the 60K... Thanks for the math check! The 500 miles only happened once... buy still the average (going back to the math) would substantially lower the overall average. I dont know where you worked because i get break down pay and a hotel paid for when the truck is in the shop. i get layover pay when loads get screwed up. i get detention pay for sitting in a dock more than 2 hours and sleep during that time. My company pays for all the rrpairs, as they should. i get safety and on time delivery bonuses, fuel bonuses and more. If you saw the cpm times the average miles per week came to $55k, then why would you expect to earn "at least $60k per year"? that makes no sense. As an engineer surely you took math classes in college. there is no way a company is going to give a good driver only 500 miles per week. were you OTR or some sort of regional? With all due respect, I belive your sports analogy is not a true comparison... If one is placed on the bench when the performance is good.. That person is being held back.. also, most players enter with a contract with a salary minimum, this would include aspectations of performance when given a enough field time.. Its impossible to show what your made of if never given the opportunity..
Alan, the top drivers in this industry are making $70,000+ per year. But none of them managed to accomplish that the first 6 months of their rookie year, and they certainly didn't quit working at it in such short order. Here's the thing - and we stress this to everyone all the time - trucking is a performance-based industry. Those who perform the best make the most money. Simple as that. Unfortunately, learning to become a Top Tier Driver takes quite a bit of time. The fact that you're hoping for a salary guarantee when your salary is based on your performance shows you're not understanding the responsibility you have for making that top salary happen for yourself. Yes, there are companies that guarantee a minimum salary but to be honest that's just marketing. Their salary guarantees are $15,000 - $20,000 less than their top drivers are making. Well there's one fundamental truth that you have to understand about the trucking industry. 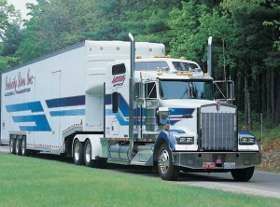 Trucking is a performance-based job. It works a lot like the sports world where the best players get the bulk of the playing time and the highest pay, while the under-performers sit the bench a lot and make far less money. I would say any system that rewards people based upon their performance is a fair but unequal system. The best performers get the best pay and treatment while the under-performers make less money and get fewer perks. That's fair treatment, but it's certainly not equal treatment. A Top Tier Driver who knows what it takes to perform at the highest level can look at any underperforming driver and immediately see why they're falling short of the mark. Ironically, it isn't always apparent to these under-performers that they're causing their own problems. If you want to make big money in a performance-based industry then you have to learn what it takes to perform at the highest level. If you're looking for a guaranteed salary then you're in the wrong industry in my opinion. People who are highly ambitious, creative problem solvers, and endlessly striving to improve their game are the ones who thrive in trucking. You left engineering because it became too demanding. You left trucking because you weren't yet performing at a high enough level to make the money you want to make. I've changed careers many times myself so I have no problem with that. But the question is what are you looking for? You don't want the pressure of engineering and you didn't want to stick it out in trucking long enough to get really great at it. I have to wonder out loud if you're looking for easy money? I mean, hey, we'd all love easy money. Unfortunately life normally only presents two choices - make a lot of money the hard way or make very little money the easy way. The dream of easy money is why poor people play the lottery.....and stay poor. In this industry you have to put in the time it takes to learn your trade and you have to put in the work it takes to make top dollar. There's very good money to be made but you'll earn every dollar the hard way. That's the best anyone can promise you in trucking. 43cpm X 2500 (average miles per week) $1,075 x 52 weeks = 55,909 per year.. I subsidized my first 3 months but even with this.. I couldn't make a consistent pay check. Please keep in mind that I'm a hard working go-getter type.. I was never late with a load and did everything possible to earn. I made myself avialible and did'nt try and go home very often. The financial burdens at home became too great to overcome. It could be that I was expecting to at least break 60K. Working 70 hours a week, I didn't think that was too much to ask for... My hats off to the great drivers that make this sacrifice everyday. Trucking is the only job I'm aware of that puts the financial responsibility on the driver when freight is slow or the mechanical failure of the truck (owned by the company) breaks down. As an engineer, if my computer breaks down at work.... It's my employers responsibility to repair this and I'm still getting paid while waiting for that to happen. I respect and appreciate everyone's input.. I'm absolutely honest and miss driving the semi.. I had one of the greatest trainers and keep in touch with him to this day.. I don't really want to list the company I worked for by name.. the company and the people are great.. I don't really blame them for my inability to make it.. I feel that it's the Industry and its structure that makes it difficult.. If this wasn't true.. their would be no so called "shortage of Drivers". I'm waiting for the day that the drivers are paid well and consistently.. perhaps this day will not come soon... until then, I'm keeping my feelers out and trying to stay informed. In the state of Florida.. I'm REQUIRED to renew my medical license every 2 years in order to keep my class A CDL..
As a pilot. If I don't renew my medical to use my flight privileges, I don't loose my License... I just need to renew it when I want to fly again.. This makes no sense to me... Just government making idiotic rules. Hello all.. I hold a Florida CDL and have 6 months experience over the last 5 years. My trade as a professional Engineer got overbearing for me and I decided a few years ago to make a change. I paid cash for CDL school, got my Hazmat and tanker in an effort to set myself up with the best way to earn. I quickly found out that the pay was terrible. The inconsistently and the complete control of others getting in the way of earning a living forced me to leave. Dispatchers, Shippers, cancelling of Freight, and sitting in the yard (sometimes for days) waiting for a load. I accepted the fact from the beginning that the pay was not going to be what I was used to in Engineering. That being said.. there where too many times that when I broke down the hours, My son made more than me working at Walmart cleaning floors. I absolutely loved driving the truck and would return tomorrow if the pay structure and ability to earn was fair. I fear I'll be too old before the industry makes this change (if at all). Is there any opportunities out there with guaranteed minimum pay? I was even willing to accept the 70 hour week, thinking that I could work twice as much and earn at least 75% of what I earned as an engineer.. I was mistaken.. I still think that with the sacrifice of being gone weeks as a Time and the dangers and responsibilities of the driver. The pay would at least, as a minimum be 60-65K per year.. I estimate if I stayed driving. I would have been lucky to earn 45K... Just not enough for the hours and dedication required. Your thoughts?